India has successfully tested two short-range ballistic missiles capable of carrying nuclear warheads, defence officials say. 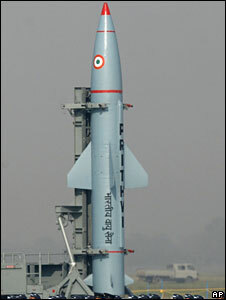 The Prithvi-II missiles were launched from Chandipur in the eastern state of Orissa into the Bay of Bengal at 1028 and 1033 local time. The 9m (29-ft) surface-to-surface Prithvi missile has a range of up to 350 km, defence officials said. The missile has already been inducted by the armed forces, they said. The two missiles have been designed to operate with both liquid and solid fuels, and are capable of carrying both conventional and nuclear warheads, officials say. India and Pakistan routinely carry out missile tests, and normally inform each other of them in advance. Tensions between the two nuclear powers has increased in recent months, in the wake of last November's attacks in Mumbai. Does nuclear status boost India's clout?